You know how some brides-to-be turn into Bridezillas? While I was quite relaxed about my ROM ceremony, I was definitely a Momzilla. I googled incessantly on “essential newborn items” and tried to create my own list of what was really needed. The problem about these lists is that most of the things aren’t even needed. Baby cots end up being used to hold laundry and fancy diaper bins get banished to the cold palace. There’s no point buying a changing table when the baby gets changed on the bed anyway. Baby products you think you need, but don’t really. There’s one item which outlasted most of the items on my initial shopping list. I’m not particular on disinfecting every surface my baby comes into contact with because it simply is impossible to do that all the time. However, I am still sterilising her bottles and my pump parts at least once a day just for a peace of mind. For newborns and younger infants, it is necessary to sterilise milk bottles and pacifiers because their immune system may not be strong enough to cope with viruses. 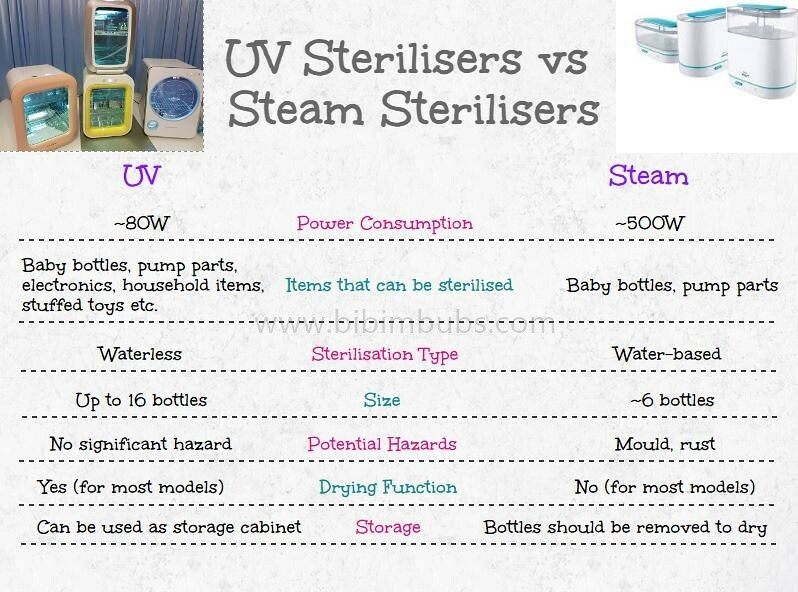 I noticed that Korean parents had been using UV sterilisers for a long time. In Korea, almost every eating place provides free drinking water and their cups are stored inside large UV sterilisers. Therefore, this item naturally got bumped up to the top of my shopping list. The Haenim UV steriliser. There are other brands in the market, but there were many positive blog reviews in Korea (Bambidonna, Happy Diaries of the Seo Sisters, MomsBlog) so I decided to go with it. 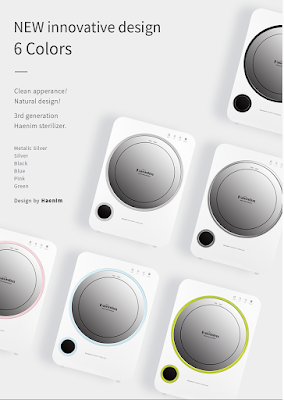 I made the right choice because recently, another Korean brand recalled its sterilisers due to its toxic (!) filters. I sent multiple variations of the same email to my husband who was working overseas then to make sure he would bring it back. After multiple emails and constant reminders, my husband and his brother lugged it back to Singapore from Korea. Unlike steam sterilisers or the old-school boiling method, UV sterilisers have drying functions so there’s no need for the additional step of waiting for the bottles to dry on a separate drying rack! Although slightly pricier, these little machines make sterilisation a breeze and there’s no risk of your bottles getting warped. When your baby grows up, the steriliser can still be used for soft toys, toothbrushes and cutlery. You can even sterilise your smartphones and remote controllers! I really hate wasting time. With this, I just wash the bottles and flanges with baby safe liquid detergent (Tollyjoy! 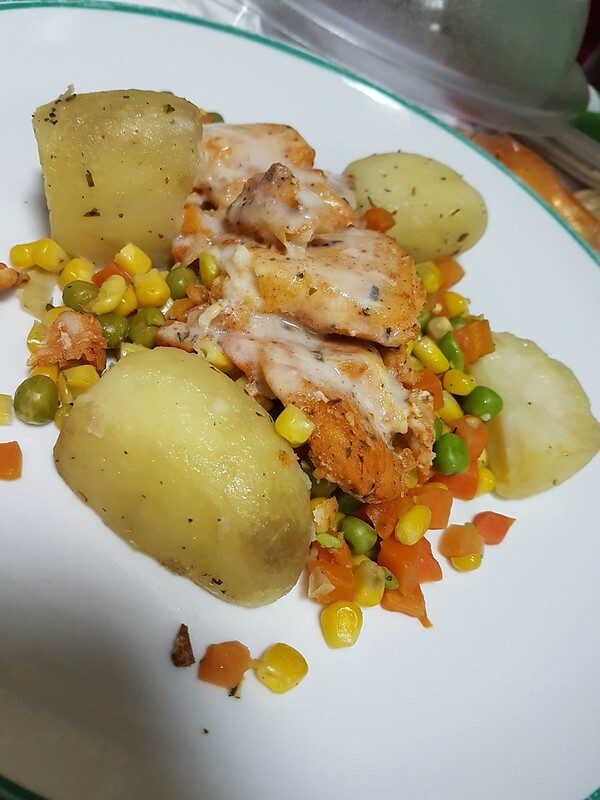 ), place them into the steriliser and press the AUTO button once where a cycle takes about 30 minutes. 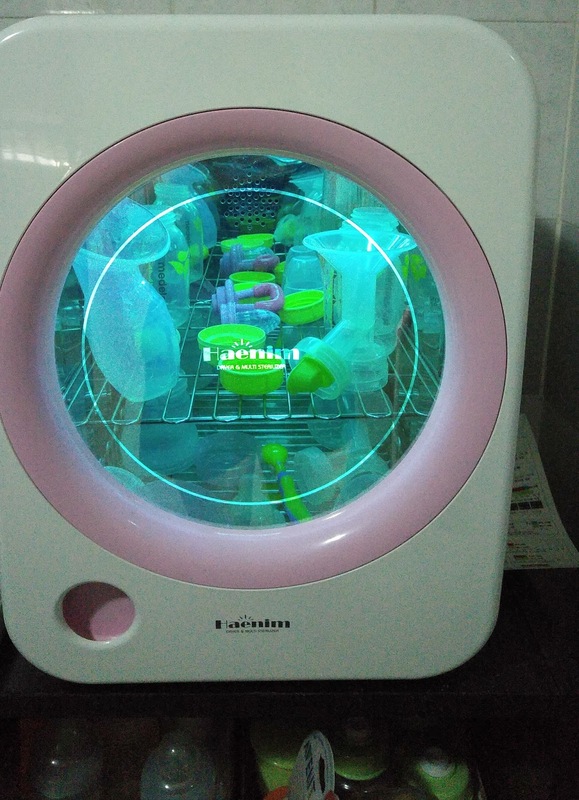 It lights up at different stages of the sterilisation process and when switched off, its mirror-like window hides the mess inside! 😀 Steriliser plus drying cabinet all at once. Fits up to 16 standard sized baby bottles, 1 large plushie and probably a hundred smartphones. Know exactly how long more you need to wait. LOW MAINTENANCE No de-scaling needed. 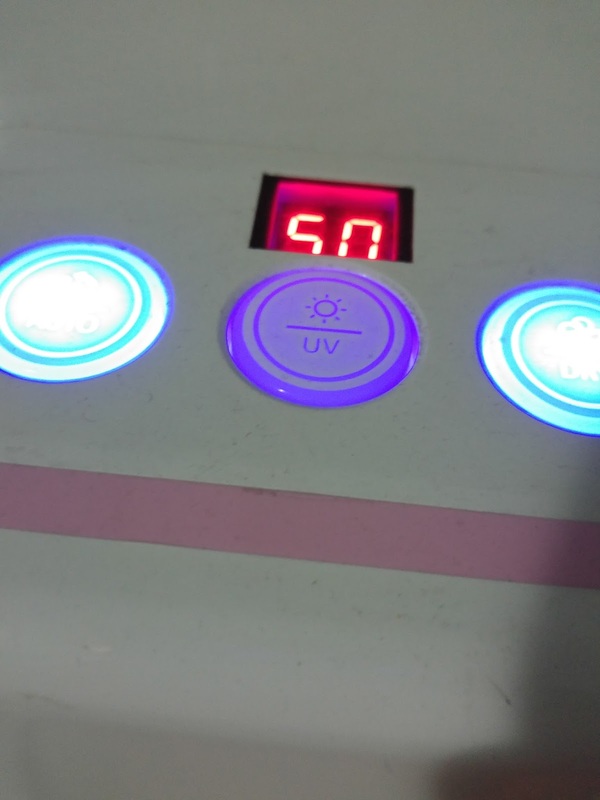 Just change the UV lamp once a year. Frustration-freeHave you ever warped a baby bottle or melted a teether in the steam steriliser? There’s no such risk when you use a UV steriliser. Choose from AUTO, UV or DRY – each button has 3 different modes. Wait for the sterilisation to be complete, or forget about it until the next time. Just like smartphones, UV sterilisers are constantly being updated with new technology. The latest 2016 model comes with bluetooth so you can control your steriliser through an app! If I’m not wrong, it’s the first of its kind. 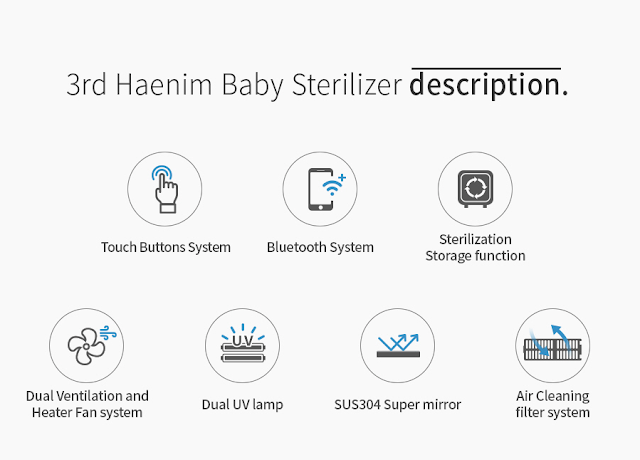 Instead of getting someone to lug it back from Korea like what I did, the Haenim UV steriliser can be easily purchased from thelittleonesinmylife which provides a 1 year local warranty and free delivery. thelittleonesinmylife is the exclusive distributor of Haenim in Singapore. 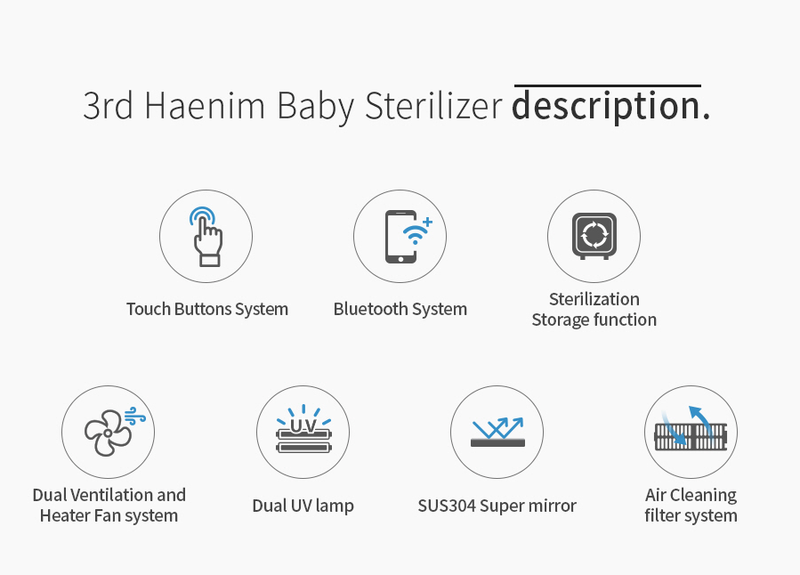 Disclaimer: I received store credits in exchange for a review of my 2015 Haenim UV steriliser which was purchased directly from Korea.